Heartwood Art was featured in the 2008 winter edition of Scroll Saw Woodworking & Crafts magazine and will be featured in the summer 2009 edition of Woodcarving Illustrated. A prototype of the only publically available carving in 2008 will be shown in one of the magazines. The final carving is pictured. You are invited to watch this carving as it was completed in the new Follow My Carving series. You can also see the latest series on my blog. In September 2008, MaAnna’s book The Sage Age–Blending Science with Intuitive Wisdom was published. Three weeks later it was featured in Publishers Weekly. Due to the response from this national exposure, she has been busy with interviews, a book tour and speaking engagements. 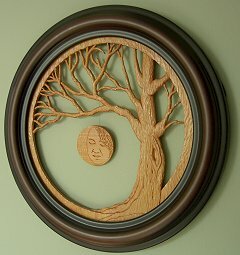 More carvings are on the drawing board for 2009, including a special Gaia carving.